I have been a singer all of my life, and throughout my life I have wandered between genres and styles with a hope of finding an expression that’s Mine and a voice that is Me. In my case there seem to be so many that I have to jump between them. But I love that one day I’ll work with the ticking metronome, measuring bars with a ruler, laying puzzles with the notes on the lines, slowly working out the logic in a complex new score and push my voice to the extreme, and the next day I will sink into the familiar harmonies of a 17th century passacaglia and just…sing. I love changing my instrument and mindset between different styles and genres and even though I might feel a tiny bit fragmented from time to time this is how I find my musical (ergo Life) balance. 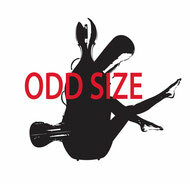 In a world that prefers us to fit in a box, it can be a difficult to be a classically trained soprano who can’t decide if she wants to sing early music, new music, pop, folk songs or jazz: but in Ensemble Odd Size there is room for all of that (and more). I was born in Gislaved, a small town in southern Sweden. When I was five years old, my parents came up with the idea that that I could start playing the cello! What an idea! I didn't know what a cello was. At the first meeting with my teacher I decided to hide behind my mother for the whole hour, but the next time I dared to sit at the tiny chair and hold the instrument. I have kept hold of it ever since. Learning through the Suzuki method is basically listening and repeating what the teacher plays, instead of reading from sheet music. It was a beautiful and playful way to learn, which I think has followed me through my life with music. To listen and repeat, react and give back, and to be always in dialogue. Maybe those are the main reasons why I later fell in love with baroque music and continuo playing. In Ensemble Odd Size I am happy to be surrounded by great musicians, communicators and listeners, always ready to catch the moment, take risks, and create together. The Messiah is a piece of music that I truly love and have played a lot. To rediscover it in this way, with these lovely, bold, funny and talented musicians is a great pleasure every time. It makes me feel happy as a five year old again! Originally from Falkenberg on the Swedish West coast now living in the vibrant Öresund region. Before getting deeply into guitars and lutes I was a tennis playing kid with big dreams of becoming the next Björn Borg. But, back at home in Falkenberg my father had a LP with Andres Segovia playing Bach and I was caught, and my focus changed from tennis to music. Since studying in Denmark and Germany I have worked as a lutenist and guitarist for the last 15 years. I play often, and gladly, with ensembles such as Barokksolistene (NO) and Concerto Copenhagen (DK), but my interest and curiosity towards other genres often leads to musical encounters outside the established platforms of renaissance and baroque music: one day songs at folk song festival, other days pub music and sometimes brand new music. As a lute player I often play several instruments (although not at the same time): theorbo, archlute, renaissance lute and baroque guitar. Alongside the baroque guitar, which I love, I very much enjoy playing a small instrument related to the baroque guitar called Charango. Though originally an instrument for South American folk music I have discovered that it works beautifully to use it for European baroque music as well. I love using it both as a solo instrument playing the violin music by Telemann, Bach, Corelli and others as well as an accompanying instrument in very different kinds of music. I’ve always had an incurably romantic image of jazz musicians, although it’s a genre that always shone in its absence from my life. The few occasions when it blossoms are when I sit at the piano with a glass of wine, even if the result is better off not shared with the world. Too late in my life I realized that jazz musicians aren’t gods, but are as flawed as the rest of us clowns, bunglers and hopeless cases, and that I can play all types of music, regardless of the tag at the music library. At about that same time I also realized that I didn’t have to choose between being a musician, a singer or a stage-director for opera: I can be all of these at once and nobody is particularly interested in what anyone else is doing anyway. However, I have received attention abroad and now work outside Sweden and saving time in my motherland for leisurely activities such a roofing my leaky old house on Orust, and trying to prevent my son from ”replanting” all of our houseplants.